The CDN HTTP Live service expects on its input an RTMP (Push) output from your live encoder such as Adobe Flash Media Live Encoder, Telestream Wirecast or Open Broadcaster and produces an HLS live stream on the CDN end delivered over HTTP or HTTPS protocol. 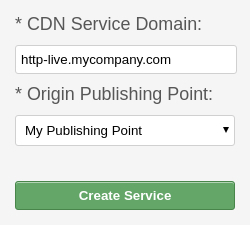 To create a CDN HTTP Live service you first need to create a Publishing Point and then you can create a CDN HTTP Live service using the Publishing Point as its Origin Publishing Point. Go to Services → Publishing Points. Fill in your desired properties as in the picture below. Click on the Create Publishing Point button. Please note that the output from your live encoder has to be in MP4 or FLV container format and encoded with H.264 video codec and AAC or MP3 audio codec. Go to Services → New Service → HTTP Live. Select your desired Origin Publishing Point as in the picture below. Click on the Create Service button and you will redirected to the CDN service integration how-to page containing all necessary information (including optional DNS instructions) required for successful integration of your CDN service into your website. The CDN HTTP Live service transcodes origin RTMP (Push) stream to HLS (Apple HTTP Live Streaming) CDN stream delivered over HTTP or HTTPS protocol. The CDN HTTP Live service delivers content via all our CDN Locations and thus has a better coverage of the world than the CDN Live service using only our streaming CDN Locations. Please note that you can stream multiple streams (determined by different stream names) through a single CDN HTTP Live service. 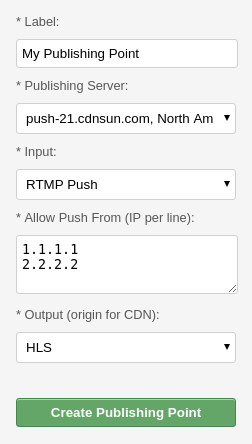 Please note that you can use the same Publishing Point for multiple CDN HTTP Live services. The CDN HTTP Live service does not transcode a single bitrate origin stream to a multi bitrate CDN stream. The CDN stream is published in the same bitrate as the origin stream. Read how to simultaneously publish more origin streams and create a multi bitrate CDN stream. The CDN HTTP Live service does not record live streams (DVR).